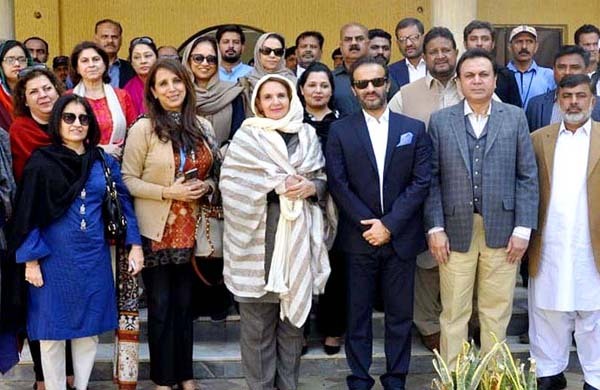 KARACHI, Jan 26(APP):First Lady Begum Samina Alvi Saturday appreciated functioning of the Pakistan Bait-ul-Mal (PBM) and expressed her satisfaction over the arrangements at its centers. She expressed her views during a visit to the PBM where she also attended a seminar, a press release said. PBM Managing Director Aon Abbas Buppi apprised the First Lady about the issues faced by the PBM and the disabled people. Addressing the seminar, Begum Alvi said she had also visited Sweet Home and SoS in Islamabad.She regretted lack of facilities for the persons with disabilities in the country and compared the situation abroad. On the occasion, she also distributed cheques and wheel chairs among the disabled people. Later, she visited hostels, classes and sweet home villa.The children presented a parade and karate programme. The First Lady appreciated the presentation and shared food with the children in the hostel mess.